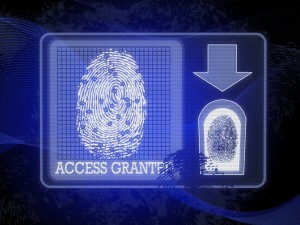 Biometric technology is the next big thing in the sphere of access control. This is because biometrics eliminate many of the potential shortcomings of the vast majority of access control technology that has been in use up to this point. How does this work? Access control technology started with bar code badges that were read by bar code readers. The problem with bar codes is that they are easily duplicated. Magnetic stripe codes are similar to bar codes. Basically the same as a credit card, magnetic stripe access involves swiping the card through a reader to gain access. However, the contact with the reader means wear and tear over time, and these stripes are also able to be forged. Proximity badges improved access control technology by eliminating the contact between the card and the reader. They are also difficult to duplicate. Smart cards took access control even further with the ability to use multiple applications, increased security over a proximity card, and affordability. So what’s the problem with all of these access control technologies? No matter how secure they are, if they fall into the wrong hands, they can still be used to gain access to restricted areas. The card and the reader don’t know who is using the access control system, just that the correct key is in use. Anyone who has the correct card can gain access to the corresponding location. Biometrics offer an elegant solution to this access control problem. Much has been said about biometric access control reader stations, but their implementation has been slow due to the cost of upgrading access control readers, especially in a large facility. By shifting the biometric technology from the reader to the card, this problem is avoided. A biometric access control card would work only for the person whose fingerprint activated it. In this way, the problem of stolen or lost access control cards is solved, as they would be useless to anyone who tried to use them. This also removes the need to upgrade readers by shifting the focus to the card. With biometric access control cards, access control systems and facilities everywhere are becoming safer and more secure. This entry was posted on Thursday, June 12th, 2014 at 1:36 pm. Both comments and pings are currently closed.